Popularly known as one of the most dangerous and frightening hikes in the world, El Caminito del Rey, a narrow, concrete footpath running through the Gaitanes Gorge in Spain, has been announced for its official reopen in January 2015. The walkway, originally built in 1905 to provide workers at a hydroelectric power plant access to cross between Chorro Falls and Gaitanejo Falls was popularly sought out in recent decades, by tourists and daredevils alike. But, as it aged, it’s lack of handrails and safety measures became increasingly dangerous. The walkway itself is only 1 metre in feet and rises above 100 metres from the river below. Numerous sections of the path are completely deteriorated or have collapsed. Related: 14 Dangerous Hikes in the U.S. So, after two fatal accidents in 1999 and 2000, the local government officially closed both entrances to the pathway. But, while the entrance has been closed, it hasn’t stopped thrill seekers. Below you can watch one particular daredevil who posted the video just this year, long after the path was closed. 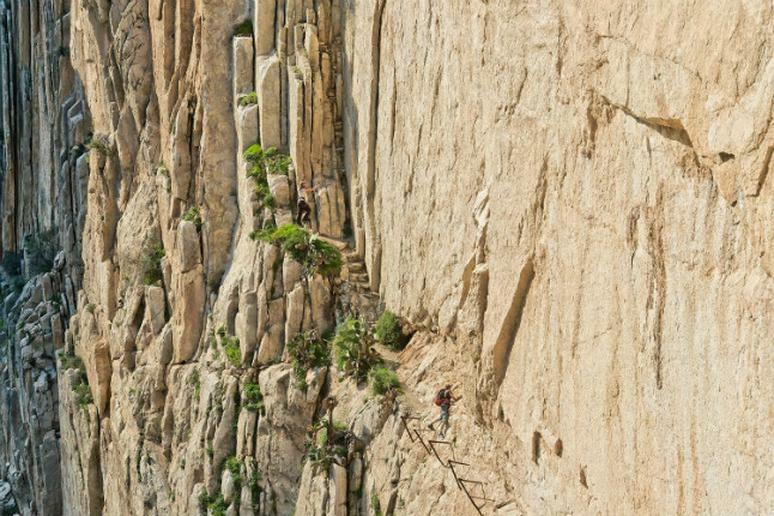 But look out for the new, and hopefully safer El Caminito del Rey opening soon. And if you wish to sneak in and try the more dangerous version, be careful, the maximum fine can be up to €6,000 for trespassers!